There seems to have been several attempts in recent years to revive what I would describe as the “Massacre” genre of video games. You know the type of game I’m talking about. 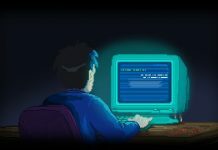 The type where you get to suspend your moral existence for a magical couple of hours and experience catharsis as you hack, bludgeon, shoot and execute your way through the civilian populace. 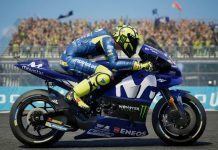 These games fulfil an important function: where once, in ancient days, we might have gone to the coliseum and watched horrifying bloodletting to get all the pent up rage out of our systems, now, we can do it virtually. There’s just one problem: every attempt to resurrect this old-school genre seems to fail. 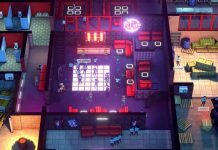 Earlier in the year Party Hard hit Xbox One and showed that meaningless violence is not actually that entertaining in and of itself. 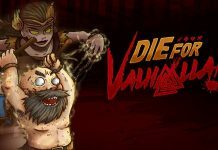 Violence for the sake of it is not only morally questionable but also not that fun for the player, because players like to get involved with the story and world as much as possible. That’s what distinguishes video-games from films and books, after all. It’s an interactive art form. More and more we crave narrative and lore. We’re fine playing as a psycho killer, but we want to know about the killer, why they’re doing what they’re doing, and what’s going through their heads. I hoped Postal Redux, being a remake of a classic 1997 title, was going to deliver on this depth. Sadly, it’s just another failure. “The earth is hungry. Its heart throbs and demands cleansing. The earth is also thirsty.” These words are the first thing you read after clicking ‘New Game: Campaign’. They are written in blood and splattered across a piece of grim, demonic artwork. An eerie industrial-horror soundtrack plays and the artwork undulates, as though maggots pulse beneath it. I was surprised by this effective mood-setting, utilising simply a load screen; it promised a disturbing experience, something artistic and meaningful. Unfortunately, the immediate cut to gameplay following this loading screen ruins the effect and feels disconnected. There is no explanation as to why the Postal Dude has gone postal or what he is trying to achieve (is he gunning people down simply for the fun, or trying to get somewhere, or find someone?). In fact, the beginning is so abrupt it almost feels like joining an online multiplayer game mid session. Oh, guess I should start shooting. 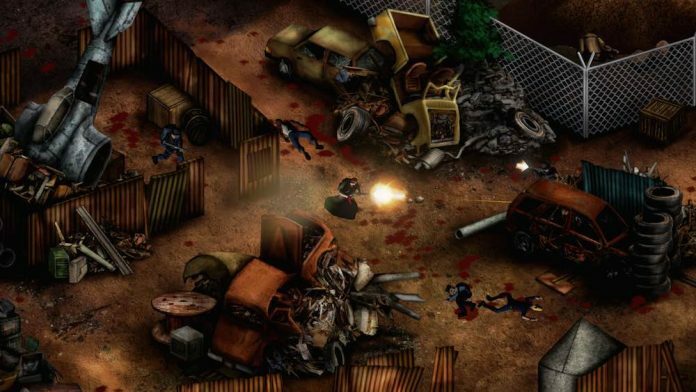 Postal Redux is an isometric twin-stick shooter, and therefore its gameplay is by definition simple. Hit and try not to be hit. Unfortunately, this gets old very quickly. Good twin-sticks know that to keep the player entertained you have to bombard them with constant variety. Anyone who has ever played Geometry Wars: Evolved on Xbox Live will have known the joy of that simple but unpredictable twin-stick – the enemy variety and weapon variety is so immense, the gameplay so aurally satisfying (the noise of the black hole imploding is like a cross between dubstep and an Emperor’s Children Noise Marine going trigger happy), that you are compelled to keep playing despite its ludicrous simplicity. Postal Redux lacks the same variety and creativity as Geometry Wars. There are different enemy types: civilians (who run around and scream), policemen, hardnuts in wife-beater vests who lob Molotovs, SWAT guys with machine-guns and the odd soldier with a bazooka, but really they all behave the same and therefore don’t offer new challenges (except the SWAT guys have obscene amounts of health – it actually gets boring pumping lead into them for so long). There are ways to mix up your kills: shoot barrels to explode them (never saw that one coming). Execute a downed enemy (be rewarded by the same execution animation every time). You can probably read between the lines here and see they are not all that satisfying. At least Party Hard tried to give you some left-field ways to end human life. Postal Redux, on the other hand, doesn’t seem to recognise how repetitive the gameplay is. The twin-stick genre is, by nature, straightforward, but that doesn’t mean it has to be the same throughout. 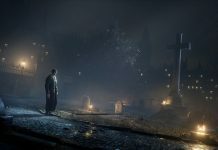 By the fourth level of the campaign, still with no further narrative input and no new enemy or weapon types, I was desperately looking for what I’d missed: a secret, an easter egg, anything to break up the monotony of running and shooting. Maybe I’ve become too accustomed to games with humongous depths like The Binding of Isaac, with its seemingly limitless weapon and upgrades and denizens. Maybe I can no longer appreciate the simple shoot-ems of the 90s? The thing is, I’m not sure I’m the only one. Times change. Artistic sensibilities and player interests change. We know what modern video games can do. 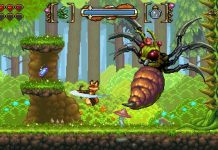 We know that even titles made by indie developers on zero budget can break boundaries and make us think differently. This game might have been successful 20 years ago, but now, it just feels a little pointless. The aural dimension to video-games is key: visual, auditory, kinaesthetic elements working together. If you are going to make a game about slaughtering civilians, at least use these to make it satisfying to do so (think of the head-popping noise in Gears of War and how that makes you go for the headshots). We want the sound of the Postal Dude’s guns to be titanic, heavy, guttural, like a demon’s roar (which would fit well given the storyline of original Postal title hinted at a demon possessing the Postal Dude). Instead, the chug of the machine-gun is faintly annoying. The magnum and shotgun are practically identical, as are several of the other weapons. The sounds of the civilians are half-baked. If you are going to make it horrifying, the screams need to be haunting enough to almost make the player stop, to give them pause to consider the gravity of what they are doing. In fact, we want it to feel like it means something. At the moment, it doesn’t. It’s dull. A chore. A to-do list. Kill this many people and take your paycheck. This approach offers us no insight into the mind of people who really do go postal; it neither condemns nor controversially vindicates their actions. Essentially, it does nothing. Even without controller-vibration, there are ways to give a game an immersive kinaesthetic dimension. 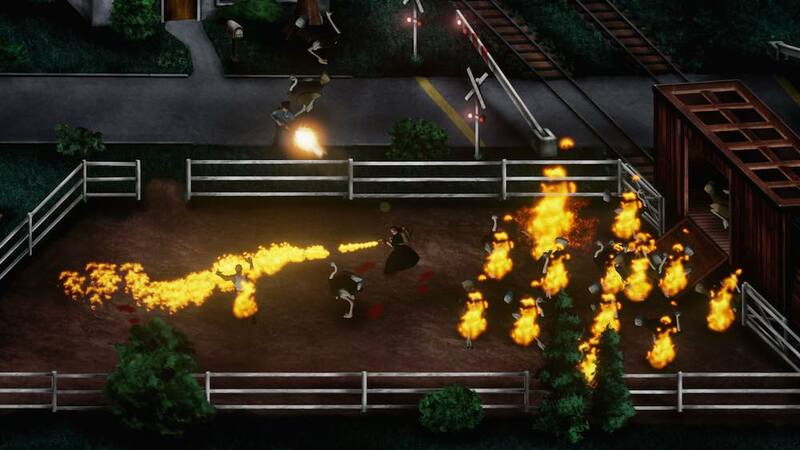 Explosions feel solid in certain games because the screen shakes or shockwave lines are rendered; alternatively, the movement of a character has been designed in such a kinematic way it seems to jump out of the screen at you. Postal Redux has none of this, making everything seem flat. Perhaps it’s deliberate, part of the isometric viewpoint, detaching you from the reality, but if that is the point of the game, to show how detached Postal Dude is, there were surely more entertaining ways to make it. Visually, Postal Redux is uninteresting and lacks intriguing level-design. There is no real artistic style to the visual elements which is a shame given how haunting the loading-screen art is, with the twisted visages of demonic entities tearing through viscera, gnashing broken teeth, staring goggle-eyed out at the player as though accusing them. Why doesn’t any of this make its way into the game itself? It feels like the menu and loading screens of one game have been shackled with another entirely different title. Even the Postal Dude’s one liners are dismally disappointing. Set someone on fire, he chuckles and says: “Smells like chicken”. If that’s not generic, I don’t know what is. It’s been a slow process, but most game developers are starting to take dialogue and writing more seriously. After all, no one is going to remember “Smells like chicken”, but they will remember “Get dunked on” and “Praise the sun!”. Good writing really makes the difference: if nothing else has proved it, the list of 2016 Game Bafta winners should. They’re practically all story driven and they all know that action sequences without context or motivation are duller than the dullest drawing-room scene. The alternative game modes of Postal Redux offer nothing further. Rampage is virtually identical to the Campaign (same maps, same enemies) except it has a points counter and is slightly more manic. There is an alternative ending that can be reached via this mode, but I am awed anyone has the patience to plough through so much tedious bloodshed to get there. If you really like twin-stick shooters, and you were a fan of the 1997 original and desperately want to see how they’ve changed the ending, then maybe, just maybe, there is something here for you. Otherwise, get your rage out of the system another way. 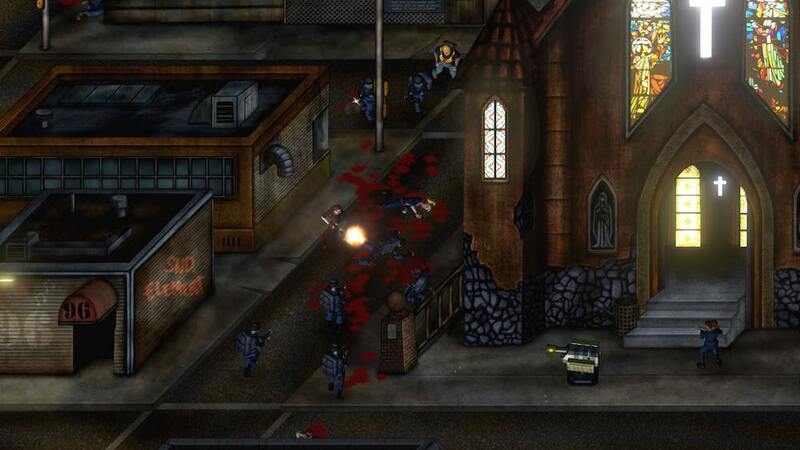 Postal Redux is available on PC.